It is 10 pm. Too late in the night by village standards. But the four ben¬ches around Mote Singh’s tea stall are occupied. People are chatting while sipping tea. More than a year ago, the stall in Sahe¬bg¬anj village of Bihar’s Muzaf¬fa¬rpur distr¬ict used to be empty by 6 pm. Singh’s fortune has been illuminated by a 15 Watt CFL. The village has an electricity grid but supply is negligible. “Till mid-2011, I used to close my stall by sunset. Managing with kerosene lamp was expensive,” says Singh, the sole earner of a fa¬mily of five, who used kerosene to light his house. Kerosene costs him Rs 250 a month. 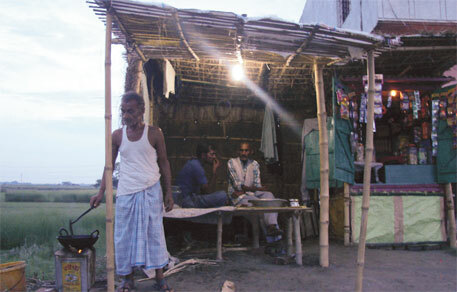 In June last year, life changed for many in Sahebganj as they started getting electricity every day from 6 pm to 12 pm. The residents thank Husk Power Systems (HPS), a company in Patna, that has installed two off-grid biomass gasification plants with 32 KW capacity each in the village. These plants convert solid biomass into gas which is then used to generate electricity (see ‘How biomass gasification works’). Each plant uses 300 kg of rice husk every day to power 40 per cent of the ho¬useholds in Sahebganj. HPS monthly charges Rs 50 per household for a 15 Watt connection for six hours a day. Money is collected in adv¬ance to avoid defaulters. Plant operators say village resi¬dents essentially require power for six hours. HPS has set up 80 such plants of varying capacities across Bihar. With big grid-connected biomass plants failing across the country, the Ministry of New and Renewable Energy (MNRE) is pushing for small off-grid plants. “They need less biomass and villages prefer selling biomass to the developers because they get electricity. Transmission and distribution losses also reduce,” says D K Khare, director of biomass gasification, MNRE. Biomass gasification is the conversion of biomass into a combustible gaseous mixture. In a reactor, commonly known as the gasifier, biomass undergoes chemical reactions in a controlled air supply. 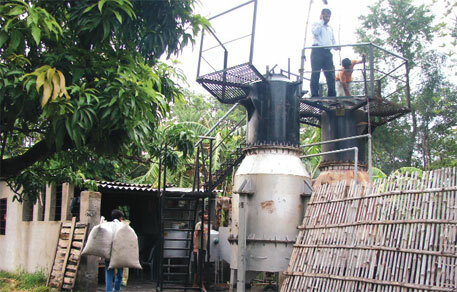 First, drying of biomass takes place in the uppermost part of the gasifier. Biomass is heated at 90°C to 100°C to remove its moisture. Then pyrolysis takes place, where dried biomass gets heated from 300°C to 400°C and volatile combustible matter is released. This leaves behind a carbon residue called char. The volatile combustible matter contains non-condensable gases and condensable oils like tar. In the third step of oxidation, controlled oxygen is provided which burns the volatile matter and char. When all the oxygen is consumed, a reducing atmosphere is created. In the reduction zone, the carbon dioxide and water vapour produced in the oxidation process get reduced to carbon monoxide, hydrogen and methane which essentially form the producer gas. Water is used to cool and clean the producer gas. Cleaning takes place through condensation. The gas is further cleaned through filters. Finally, the gas is fed into a gas engine which converts it into electrical energy. Although most experts hail the HPS model, there are a few critics. Sunil Dhingra, sen¬i¬or fellow at Delhi NGO The Ene¬rgy and Resource Institute, says developers are charging unreasonably due to unregulated tariff for off-grid energy solutions. HPS charges Rs 18.51 per unit, while an average consumer pays Rs 4 per unit for conventional energy. “States should decide on a reasonable tariff and some of it should be subsidised,” suggests Dhingra. For instance, if the government decides Rs 10 per unit as tariff and the cost of generation is Rs 13, then the balance (Rs 3) should be subsidised, he says. Ratnesh Yadav, co-founder of HPS, clarifies that if a developer charges an exo¬rbitant amount the public will not pay. “We operate in a market where the moment we charge irrationally someone will replace us,” he adds. Residents of Sahebganj are happy with the tariff they are paying. “It is cheaper than kerosene and die¬sel,” says Sohan Ram, who has taken a 30 Watt connection. For diesel operated energy, a 15 Watt connection costs Rs 100 for four hours. Despite large-scale availability of biomass and the subsidies provided by MNRE, the power developers are charging more tariff, says Dhingra. The ministry gives Rs 15,000 per KW and Rs 1 lakh per km for a transmission line of up to 3 km. Going by this, if HPS—which says its 32 KW plant costs Rs 18 lakh—avails the maximum subsidy, then 45 per cent of its cost would be subsidised. Greenpeace India, which advocates the HPS model, proposes an alternative for tariff regulation: the government should set up small distribution networks (mini-grids) in villages. “It can enter into a power purchase agreement with the developer to buy power at a preferential tariff from the developer and collect the standard tariff amount from the consumer,” says Manish Ram, renewable energy analyst, Greenpeace India. Suppose, the government is buying power at Rs 10 per unit from the developer, it can charge Rs 4 per unit from the consumer and subsidise the rest over a period of time until they eventually reach grid parity (the point at which the cost of renewable energy equals the cost of utility power from conventional sources). Later, the mini grids can be interconnected with the main grid. But an MNRE official, who wished to remain anonymous, says HPS is charging what people can pay. The debate is useless be¬cause the Electricity Act exe¬mpts developers from taking any licence to provide power in rural areas. “The Act also says the tariff should be decided by the electricity regulatory commission after consultation with the consu¬m¬ers,” says Ashwini Chitnis, senior researcher with NGO Prayas Energy in Pune. The developer should not be given free hand, adds Chitnis. HPS says it cons¬ulted with Sahebganj residents before deciding the Rs 50 tariff. Decentralised distribution guidelines of the Ministry of Po¬w¬er say that tariff in an off-grid village sho¬uld not be more than the ta¬riff in the neighbouring grid-connected village. Ram, along with rest of the residents of Sahebganj, says he would prefer uninterrupted full-day supply of electricity, if tariff is reasonable. But developers say 24-hour supply would increase generation cost which will have to be passed on to the consumer. “If a developer runs the plant for the whole day, an optimum load needs to be maintained. If tariff increases, people may reduce power consumption to save cost. The unused power is a cost to the developer,” says H S Mukunda, senior scientist at the Indian Institute of Science in Bengaluru. To ma¬tch the extra load, small industries can be set up in a cluster of villages, he adds. The dev¬eloper may then charge higher tariff from the industry and lower tariff from domestic users. “Such an experiment is yet to happen,” says Sangeeta Kohli, professor at IIT-Delhi, who has worked as a consultant with biomass power developers. Last year, the World Bank published a report on the status of MNRE’s Village Energy Security Programme (VESP) under which off-grid biomass plants were set up across the country. The report, India: Biomass for Sustainable Development, said that since 2005, when VESP started, only 45 of the proposed 95 projects have been commissioned. Most of the commissioned projects were closed for long periods because of poor aftersale service. Other reasons include inadequate training and lack of interest among people in operating the plant and supplying biomass due to absence of incentives. The programme was discontinued in 2009. N P Singh, director of biomass, MNRE, says community-based projects fail because villages do not take responsibility. “They want the government to perform all tasks,” he adds. Kohli of IIT says to increase acceptance among people for off-grid energy solutions, employment generation is the way to go. Yadav of HPS agrees. He says, “We have employed women to make incense sticks out of char, a by-product of biomass gasification.” Of the total biomass used in a gasifier, 40 per cent converts into char. Small-scale biomass plants are generally based on gasification technology. It is cheaper than combustion technology. While 1 MW of gasification plant costs Rs 6.5 crore, a combustion-based system is worth Rs 8 crore. Another reason biomass plants are set up on a small scale is that gasification equipments like gas engines are available only in small capacity, up to 2.5 MW. A major problem in the gasification process of biomass is the production of tar and wastewater. The gasifier runs best on woody biomass because light biomass, like rice husk which is used in most plants in Bihar, can choke the reactor where combustion takes place. Rice husk has the highest content of ash (20 per cent) among all the agricultural residues of the gasification process. If this husk is burnt at the regular temperature of 1000°C in the gasifier, the ash will produce clinkers that will jam the reactor. To avoid clinkers, temperature needs to be lowered at 850°C, but this drop in temperature results in more tar. Inside the gasifier, water is used to clean the gas of impurities by cooling. Impurities either condense or get dissolved in water. This water can be used for a month in the system, after which it becomes saturated with impurities. “It needs to be treated before letting it out of the system,” says Mukunda. With no checks in place, plants often avoid it. At present, there are no standards for gasifiers, which affect their efficiency. “Bureau of Indian Standards is working on them,” informs Khare. For HPS, efficiency of the gasifiers is not a priority. Most of the existing plants are based on the basic technology with efficiency of 65 per cent. “Technology with up to 85 per cent efficiency is costly and requires skilled and expensive manpower,” says Yadav. A 35 KW plant with 85 per cent efficiency would cost Rs 30 lakh. “Our priority is to give employment to village residents, who may not be able to operate plants based on a sophisticated technology,” he adds. Yadav’s plant directly employs four people in a village of more than 1,000. “People can be trained to run a sophisticated system,” contends Mukunda. Sophisticated technology like fluidised bed biomass gasification system, where air carries biomass in the gasifier, is yet to be successfully experimented. This system is used in coal-fired power plants. In conventional plants, biomass has to be manually churned to avoid choking of the reactor. As a demonstration project, MNRE is supporting a memorandum of understanding (MoU) between Ruchi Soya Industries Ltd and Thermax Ltd to set up a 1 MW fluidised bed biomass gasification system in Mahar¬ashtra. The MoU claims the system will be 95 per cent efficient. Mukunda doubts this figure. “Fluidised systems produce 20-50 per cent more tar,” he adds. But Thermax stands by the system’s efficiency. “We have the technology to reduce and manage tar,” says R R Sonde, executive vice-president of Thermax. It is disheartening to hear of companies doing what HPS is doing and to have people like Sunil Dhingra criticizing the great service they are providing. Mr. Dhingra sounds like an academic, yet what is required when proposing policy is on the ground experience. Lets consider the regulation he proposes. Later in the article there is evidence that government involvement only creates problems; government supported biomass facilities fail because the long term commitment isnt there. What happens when government commitment to subsidizing off-grid policy also dwindles? HPS will be stuck, unable to increase price to its customers and yet forced to pay for higher operational costs. The company wont be able to cover costs and the business model will fail. And failed businesses will only discourage investments from others. What is required are business models that are commercially viable without government subsidies; those are the only ones which will be able to sustain quality service delivery. The government's investments have not worked to date; 400 million people in India, larger than the total populations of all but two countries (India being one) lack access to electricity. Let the decision on tariff be decided by HPS's customers who seem to be happier with HPS's service than they are with what the government is providing - kerosene. If they are willing to pay, then it is better than any available alternative. And providing something better isnt something we should regulate. It seems easy to criticise new initiatives such as the one by HPS. The question is what better alternatives do the villagers have? Should they be condemned to wait indefinitely for grid power, which will anyway highly unreliable as other villages are experiencing. Let us remember that the true cost to the society of the electricity from conventional power plants such as hydro, coal and nuclear are much more than what is being charged today. Some high level calculations indicate that they may be in excess of 20 Rupees per Unit if all the direct and indirect costs to the society are taken into account. It would be desirable that the government take the initiative to develop a highly efficient technology to harness the bio-mass, and come up with a tariff mechanism acceptable to different stake holders. In view of the huge social and environmental costs associated with conventional power plants, and the unacceptability of our villages not having electricity at all, we should objectively consider various options without any bias. HPS is one alternative solution in the prevailing power crises (30th Nov. 2012 DTE.). The societies should learn out of this local technology based on the raw material available. This can be used to the maximum extent possible as it fits to the local solution with local resources. Knowing the limitation of Thermal, Hydero & Nuclear Power Generation, in addition to the HPS, solar based power generation should be encouraged with matching solar panels and batteries with effectiveness on power and cost. The Government and Research Institutes should come out with better models of panels and batteries with better quality. These local solutions helps greatly to resolve the POWER CRISES. A homemade magnetic motor can provide you with a limitless amount of low cost electrical energy. it certainly gained a lot of ground with his research. I have soybean husk,agro waste,in large quantity are you interested in purchasing it for power generation.